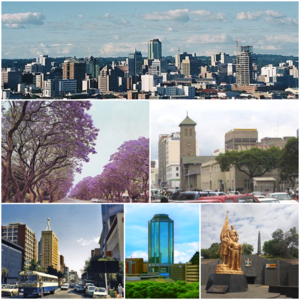 ^ "'Harare among world's worst cities to live in'". DailyNews Live. Retrieved 2018-08-02. ^ Hoste, Skipper (1977). N.S.Davies, ed. Gold Fever. 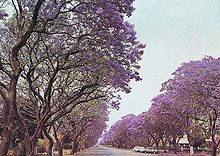 Salisbury, Rhodesia: Pioneer Head. ISBN 0-86918-013-4. ^ Madalitso Mwando (2015-03-27). "Zimbabwe Capital Turns to Solar Streetlights to Cut Costs, Crime". allAfrica.com – Thomson Reuters Foundation. Retrieved 2015-03-28. ^ Pennick, Faith; Calhoun, Jim (1990-08-05). "Harare newest link: Cincinnati adds sister city in Africa". The Cincinnati Enquirer. Retrieved 2018-05-21. ^ "Harare twins Guangzhou". The Herald. 2015-09-22. Retrieved 2018-05-23. ^ Kalayil, Sheena (2015-04-02). The Beloved Country. Grosvenor House Publishing. p. 29. ISBN 9781781484647.